Likuni Phala is a porridge made from maize. I think maize is like our sweetcorn and it is ground up to make the porridge and vitamins are added. Mary's Meals are sending me some and it should arrive tomorrow. I will be cooking it for my porridge party on Thursday to celebrate raising over £100,000. I'm looking forward to a big mug of it like the kids have in Malawi. My uncle has said he will eat porridge on Thursday too and donate the cost of his dinner to Mary's Meals. We don't have porridge at school but once we had semolina but I didn't try it. I think I had a yoghurt. It was my dream school meal today because it's all my favourites mixed together. I knew it was chicken curry but I didn't know until lunchtime which I would get but I was in the korma queue. I had lots of salad today and I really enjoyed it. I chose potato salad, radishes, carrot, peppers and cucumber. If I could only eat one salad off my plate it would be the radishes. The shortbread wasn't as good as grandpa's because grandpa's is soft all the way through not crunchy like today's. I sometimes dip my shortbread in my ice cream. 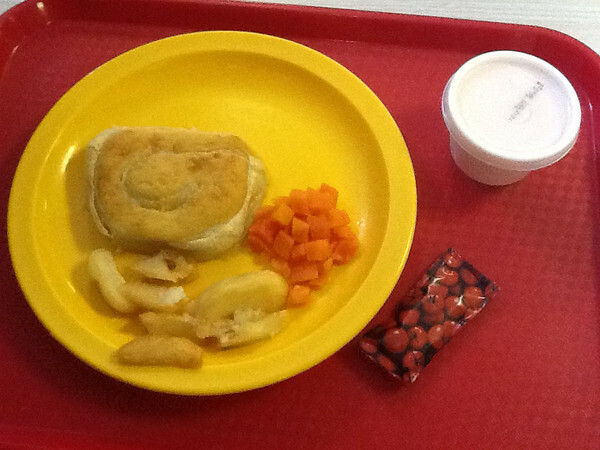 'Every week we have the same meals but we have at least 4 different options each day, there is always a veggie option. Today it was Cheese Swirl, Carrots and Potato Wedges and for dessert Strawberry ice-cream. It was DELICIOUS!!! I think your meal is quite small. I would like to have it but I'd like it to be bigger. Maybe your plate is very big and it looks small. Veg- to me,the chicken curry meal looks like the best yet! How grand that the Porridge Party will be Thursday, I look forward to it and the ensuing picture! Maize, semolina, polenta and corn meal are all similarly ground cereal grains cooked as porridge, semolina being from wheat. I think you would have enjoyed the semolina served the way New Englanders serve Indian Pudding - a corn meal porridge. It is traditionally served with molasses or maple syrup and butter, yum! Martha, your school's dinners are definitely improving. You have made such a difference. Someone is listening (or reading) and taking note! Hooray!! I have porridge for breakfast every morning but mine is the traditional oat one. You are quite right, maize is just another name for what we call sweetcorn and it's a very popular staple food in many areas (South America as well as Africa - some tortillas are made with maize as well as it being the basis of nachos, both of which are very common in Mexican food). Your lunch today looks tasty and a good balance of protein, carbohydrates and veggies. How interesting that Daisy is a vegetarian at her age - I don't eat meat (although I do eat fish) but I didn't opt for that diet until I was in my 20s. I hope you get to have your porridge party on Thursday! Maize is similar to sweetcorn but isn't soft and sweet. It's what cornflour and cornmeal are made from. In the states where I grew up it's made into cornbread (yummy!) I also made porridge from it but we called it cornmeal mush! I would make it up, chill it overnight and fry slices of it for breakfast. It's really popular in the southern states where my father was from. I'm originally from the American South (Georgia), and in that part of the U.S., there is a speciality called grits. Grits are maize that has been treated with lye, which makes the kernels expand enormously. The kernels are then dried and ground to a gritty texture, hence the name 'grits.' The grits are then cooked with water, to make sort of a polenta, and served with melted butter over, and salt and pepper. Bit of an acquired taste for those not born where I was, but delicious to those of us who love them. If you ever get a chance to try some, I urge you to do so! Today's lunch looks like what you should get every day - better nutritional balance, and a nicer portion. I moved to TX in my 20s, but I eat grits like a "Yankee." I put butter and sugar or brown sugar in them. I like sweet over savory, but I have a feeling I'm breaking an unwritten Southern US law every time I eat them this way... They sure are good, though! We have a kind of maize porridge in Brazil too, it's called mingau de fubá. There is a sweet version, with the maize cooked with water, sugar and then we put some cheese on the bottom of the bowl, so that it melts when you pour the hot porridge, you should try it! And also a salty version, like a soup, with bits of onions and parsley, in which we crack an egg on top while it's cooking so it's like a poached egg. They are both great and perfect for winter (which just started here). You got me curious so I looked up the recipe for Likuni phala on Mary's Meals website. It's mostly maize, but also has soya flour (mixed 4 cups maize to one cup soya). I think it will be pretty bland without adding something else for flavor...Mary's Meals seems to use fruits or milk or groundnut flour. So you may want to have something like that ready for Thursday! As many have already confirmed to you, maize is the same as sweetcorn, though sweetcorn is probably sweeter and more tender. only for a few minutes. Coat with a dab of butter. Sweetcorn needs to be very fresh. Literally straight from the pan into the pot. If you see it with the green all dried, then not fresh. The seeds sown in my garden in early may, I have sweetcorn growing in my garden. The cobs were from a friend's farm in Tenerife. These are yellow and red. I once had blue sweetcorn. This was from a Hopi Indian from the US. To them it is a sacred plant. Sadly it did not grow. I live in Cyprus and here you can find in the evening many people selling roasted sweetcorn on the streets.Very nice. I really enjoy reading your blog, keep up the good work. VEG i do have the stong feeling schools meals improved daily since your blog became so famous! Go on! I wish you get more veggies, salad etc. maybe some fruit. and more dietary fibre. Greetinxx from Germany > Bavaria > 70km north of Munich. "Lye is a corrosive alkaline substance, commonly sodium hydroxide (NaOH, also known as 'caustic soda')"
You must be the coolest kid in the world! Keep it up no matter what people say! Good luck with your porridge party - great start to the day ! Your dinner looks so much nicer than the one from Manchester. 6 potato wedges is a bit mean and not very nutritious! Good luck with your 'likuni phala' , Veg! It will be fascinating to taste what people in another country eat, without travelling there to taste it! I like the photo of your meal today, it looks taste and wholesome. How long is it til the end of term?! Actually Neesargon, Sandy is correct. The lye is rinsed thoroughly before the grits are eaten. Lye is also used to make hominy. I think I'd dip my shortbread in the icecream too :) nom nom. I love the porridge party idea. I can't buy oatmeal here in my corner of rural Japan and ordering it from Tokyo would probably defeat the purpose of trying to not spend money to raise money. The equivalent here is 'okayu' which is a runny kind of rice. We have rice paddies out our window and its rice planting season now. Lots of rice! You can't celebrate reaching 100,000 - because it is already 108,000! Well done. I was born in Malawi - and very much enjoyed eating the local food there! Have a good party! I do hope your lunch was fine today (27th). Soup: Spicy curry with baked beans. Lunch: Noodles and Soja based Bolognese. Dessert: Sweetened yogurt combined with sallow thorn and on top red fruit (raspberry and strawberry berries) sauce. Price: around 4 EUR and some Cents. Taste: The soup was great, the bolognese a bit lame but the dessert lovely. Where: Mensa Nord (North), Berlin. A inspired and friendly team. Your lunch looks "delish" today! I so enjoy reading your posts, and I'm looking forward to reading about the porridge party! I've been encouraging everyone I know to read your blog since I discovered it, so hopefully lots more U.S. readers are checking in. Have a great day! Hi Veg, I love your blog. Like many other people I found it via the news websites when it was temporarily put on hold. Power to your elbow and well done for being the cause of SO MUCH money being raised to feed hungry children! Your curry meal looks good, but I wonder if your school ever uses brown rice, rather than white? Brown basmati rice is delicious, and it's supposed to be better for you because of being the whole grain rather than a polished, refined version. 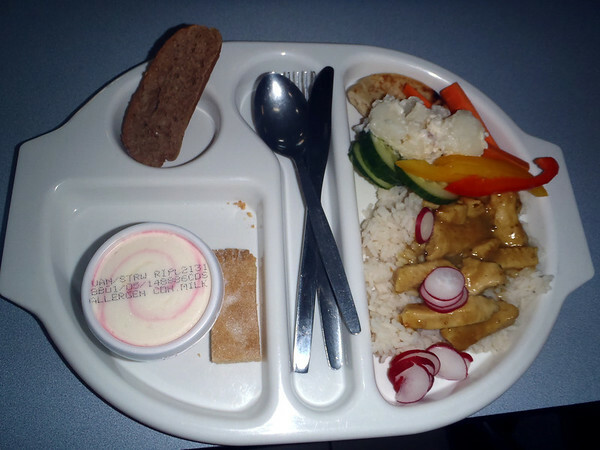 It's so interesting seeing what children around the world are eating for their own school lunches. It's always especially cool to see schools where the pupils grown and/or cook their own food. Although it would be a bit off-topic for a blog about school dinners I'd like to hear more about your own polytunnel at home and what you grow there. I hope your porridge party is fun. Enjoy your Likuni Phala! we used to have semolina at school - I think they served it with rosehip syrup; have you ever tried that? I hope your blog can raise the standard for school meals everywhere and parents like me would feel more confident about buying a lunch for our children. At the moment what my little boy would get is not good value and small children are not always good at making a sensible meal choice when it IS available. With a packed lunch I know he is getting good fresh food and I always give him a good home-cooked hot meal at tea time. Mary - great work with the charity and of course with your blog concept and execution.